It’s a familiar story; young families and first-time home buyers find themselves out-priced from urban cities decide to trade in their bicycle commutes and nightly happy hours for two-car garages and A+ school districts. Though the suburban sprawl is nothing new, some metropolitan statistical areas (MSAs) are seeing these areas outpace urban areas in terms of population growth, price growth and overall popularity. 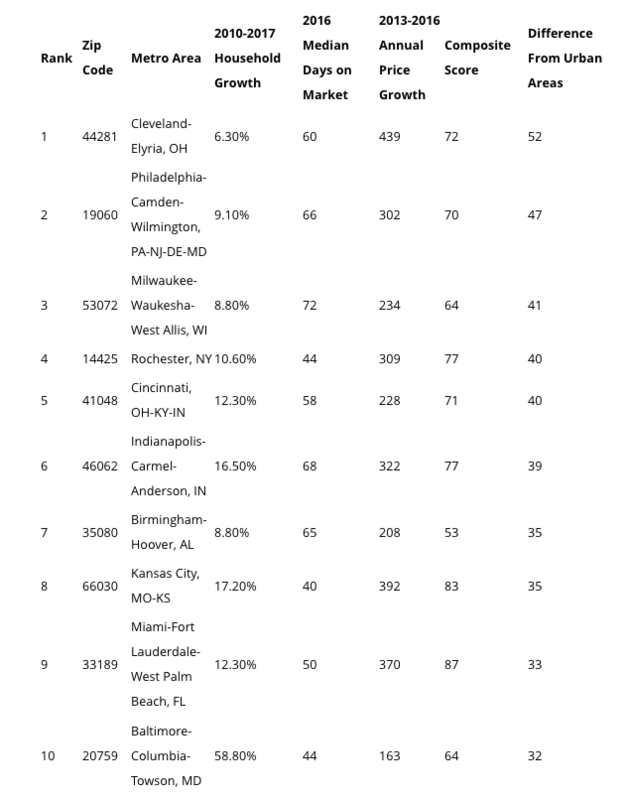 * Since 2013, list prices in these top ten suburbs have grown about 2x faster than their associated urban zip codes and at an annualized rate of about 17%. * Real estate investors are seeing an opportunity in these ten suburbs to buy reasonably priced properties which could continue to appreciate faster than their urban counterparts. What do these suburban areas have in common? Slow recovery from the real estate collapse? Rebounding job markets? While it would be fair to conclude that some of the suburban home price appreciation is attributable to the proximity to the rapidly growing urban centers nearby, these suburbs seem to be an anomaly in that, that relationship doesn’t tell the whole story. Perhaps it's the influx in investor purchases revitalizing these once distressed suburbs. While the precise reasons for the disparity between the urban home prices and suburban prices are unclear, these top ten cities offer an opportunity for investors to enter the market at a lower price point with higher expected appreciation compared with the costs in their associated urban markets. *Data from Realtor.com. Lists the 10 suburban neighborhoods which have the greatest composite scores (combination of listing price growth, household growth, and hotness) compared to the typical urban zip in their respective metros.